Figure 3.56: Vector illustration of the path walked. This is College Physics Answers with Shaun Dychko. So it's nice that this textbook provides us with a nice picture of our situation here. First you walk 12 meters in a direction 20 degrees to the west of north, and then walk 20 meters in the direction 40 degrees south of west and you end up here. The resultant vector or the displacement vector connecting your initial position with your final position is here. These vectors A and B have been added together using the head to tail method. Our job is to figure out what is the size of this resultant vector and what is its direction. So we know that the x component of the resulting vector will be the sum of the x components of the other vectors, Ax and Bx. So to calculate them, notice first of all that there is a bit of a tricky thing here that we use sine on the one hand and then we use cosine on the other. So you can't just follow a recipe where you memorize that the x component is always cosine and the y component is always sine. That's not necessarily true. It often is, but in this particular question, though the way they've drawn it and the angles that they've given you, it turns out that the x component of the A vector is using sine because it's the opposite leg of this triangle here. So this is the triangle that makes up vector A and its opposite leg is opposite the angle given and so to find the opposite leg of the triangle we use the trigonometric function sine, multiplied by the hypotenuse. Then we're finding the adjacent here which will be the y component of A, we're going to end up using cosine. Okay. So we go 12 meters times sine twenty and we put a negative in front of it because we can see that it is directed to the left. We'll assume that to the right is positive, and so we have a minus in front of that. 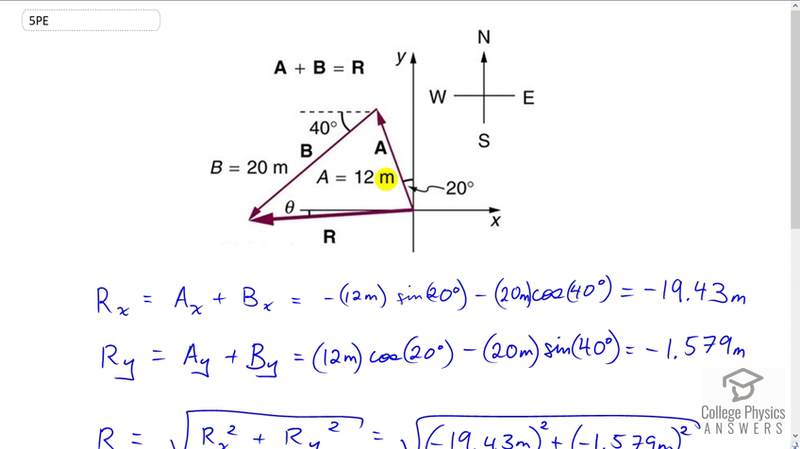 Then likewise, minus 20 meters magnitude of vector B, multiplied by cosine of 40 because the x component of vector B is the adjacent leg of this triangle, and this gives us negative 19.43 meters as the x component of the resultant. Now, for the y component we have 12 meter magnitude of vector A, times by the cosine of 20 to get the adjacent leg of this triangle, that's positive and so we did not put a minus in front of -- we did not put a minus in front of this term. But we do put a minus in front of the y component of vector B because it is directed downwards. Here is the y component of vector B directed down here. So we have a minus 20 meters times sine 40, and that gives negative 1.579 meters and that's the resultant y component. So if we were to draw the resultant y component it would be like this. What I mean to say is I draw the components of the resulting vector it would look like this, this being the x component of the resultant, negative 19.43, and then the y component directed down, negative 1.579, and this is the resultant here. Okay. So now that we know the legs of this triangle, we can now calculate the length of the hypotenuse which is the magnitude of the resultant, and then we can also find the angle in here. So the size of the resultant is the square root of the sum of the squares of the components, so that's the square root of negative 19.43 meters squared, plus negative 1.579 meters squared, giving us 19.5 meters is the length of the resultant. Then for the angle, we take the inverse tangent of its y component divided by its x component and there is little vertical bars here to say absolute value or to say ignore the negative sign. We're just going to take the magnitude of these components. Then the direction we'll figure out by looking at the picture. We don't need positives or negatives to tell us direction. So, we have 4.65 degrees because that's a little bit in here, this is 4.65 degrees towards the south compared to west. We're south of west. So our resultant is 19.5 meters, 4.65 degrees south of west.